In medium bowl, combine flour, sugar, cornstarch and salt until completely combined. Add canola oil and beat until well combined. Add water, almond and vanilla extract. Mix. Stir in almonds and dried apricots. Scoop batter with small ice cream scooper, melon baller or spoon, making all same size. Place them on ungreased baking sheet about 1-inch apart. Bake cookies about 12 to 15 minutes or until just set. Cool on baking sheet for 2 minutes and then transfer to wire rack until just warm. Pour powdered sugar into bowl. 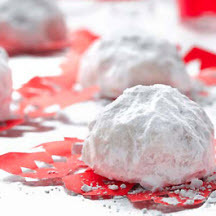 While cookies are still warm, but not hot, roll in powdered sugar. It will adhere slightly to cookies, making them look like snowballs. Return cookies to wire rack and when totally cooled, roll in powdered sugar again. Nutritional Information Per Serving (1/36 of recipe): Calories: 130; Total Fat: 5g; Saturated Fat: 0g; Cholesterol: 0mg; Total Carbs: 20g; Fiber: 0g; Sugar: 13g; Protein: 1g; Sodium: 20mg; Potassium: 42mg. Recipe and photograph courtesy of CanolaInfo.org.